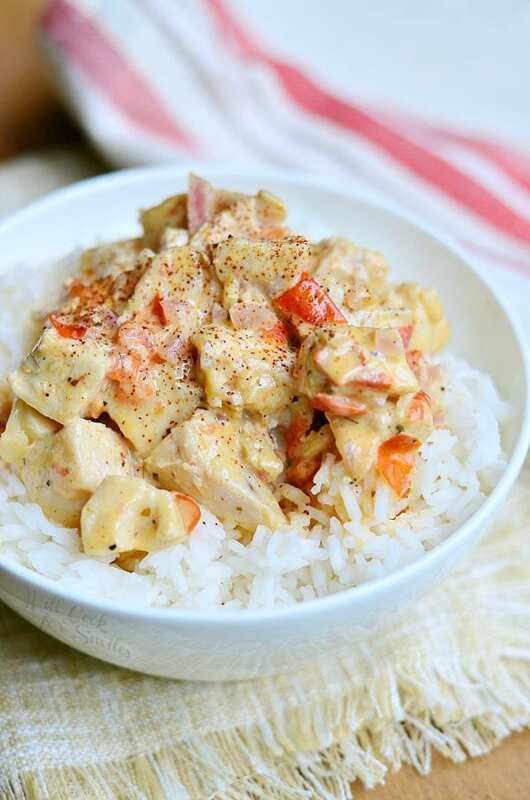 This is one unusual and amazingly delicious dinner! 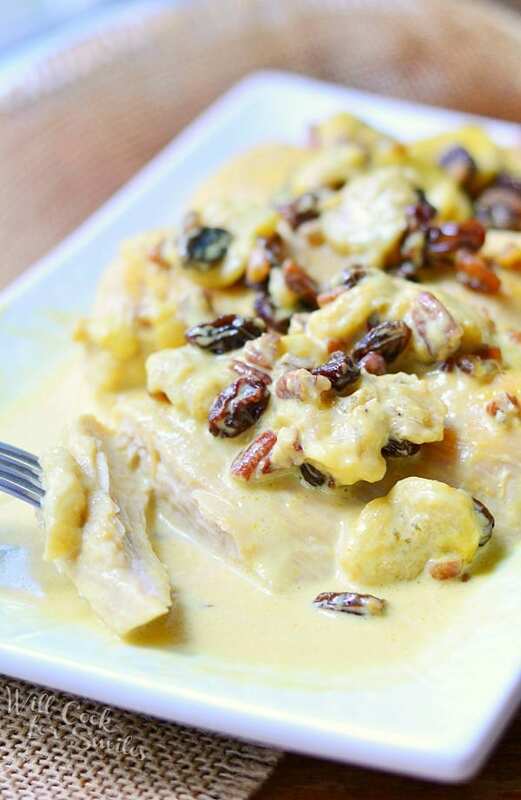 Chicken cooked with bananas, pecans and raisins in a creamy banana curry sauce. Absolutely mind-blowing! This week has been a walk down food memory lane for me. I made another dish that we used to serve at our family restaurant. It was incredibly popular. That’s probably why I remember it so well, because of how many people loved it. Although back then, it took me a long time to even try it. Something about fruit in savory dishes used to throw me off. The day I finally tried it, I actually said “Oh…my…God, this is incredible!” That may have been the moment I started trying foods that I didn’t think I liked. I was a little nervous about recreating this dish after so many years because there are never actual recipes when it comes to my family. All the cooks in my family are either trained chefs or life-time cooks who don’t use recipes. When it comes to cooking, I don’t use recipes either and actually have to remind myself to write down and measure what I make because I just go. Can’t tell you how many recipes I have not posted because I forgot to write down the recipes. That’s pretty much it. I’m glad to have cooking experience (and I know not to ever ask my mom for measurements) because I really doubt that anyone else would be able to get a recipe out of her. I’m sure that if you would put a dish in front of a chef and ask them to taste and recreate, they could do it in a flash but like I mentioned, I haven’t even tasted this dish in over 12 years. Needless to sat, I’m extremely proud of myself for getting this recipe spot on from memory and mom’s description. 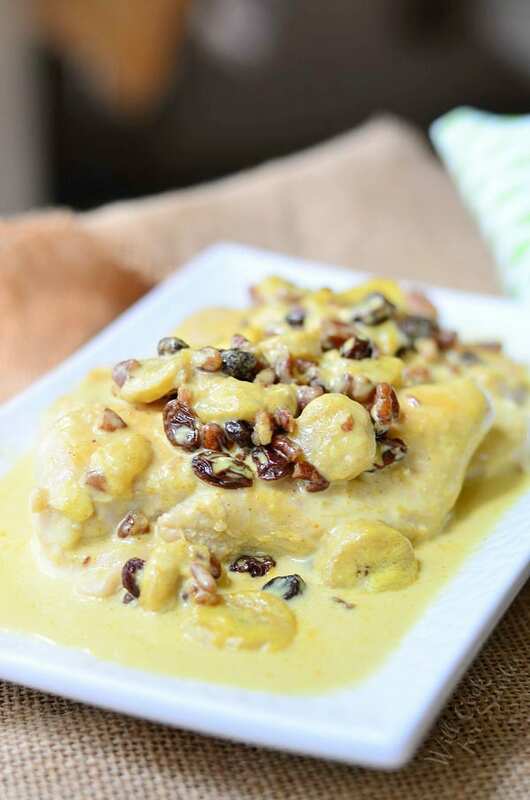 Chicken cooked with bananas, pecans and raisins in a creamy banana curry sauce. (If the chicken breasts are thick, slice them in half, width-wise.) Preheat a cooking pan with some oil over medium heat and cook chicken breasts with a little salt until almost done. Take out chicken and set it aside. 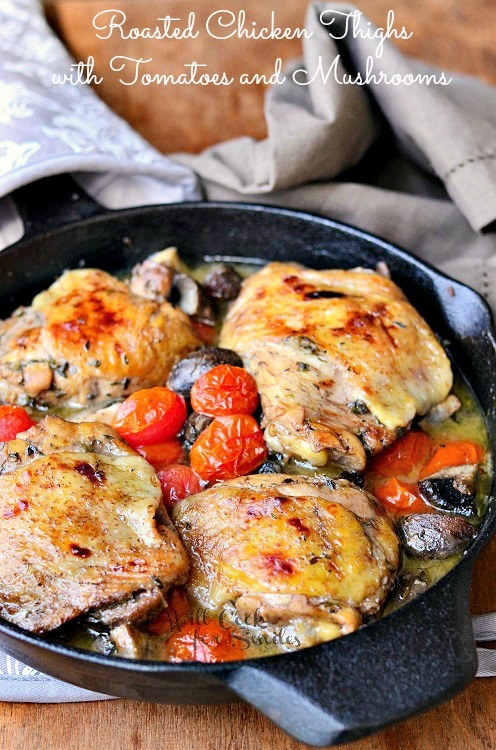 In the same pan, deglaze the pan with banana liqueur and add chicken stock. 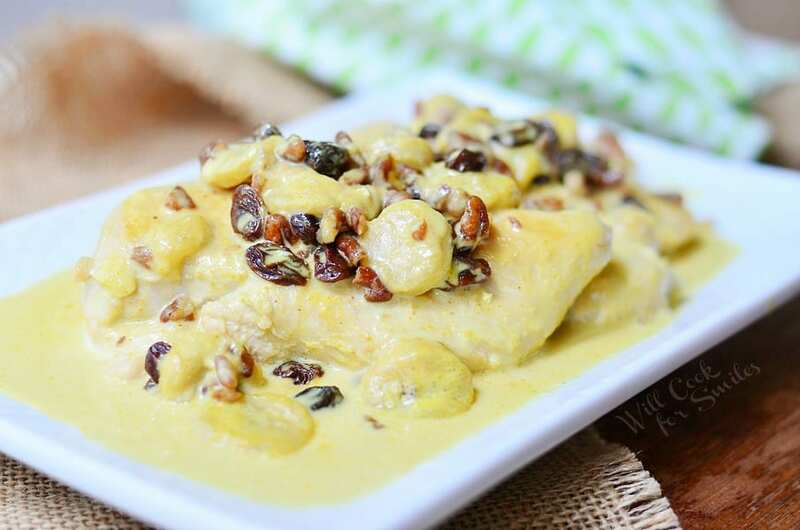 Add sliced banana, raisins and nuts. Add heavy cream. Season with salt and curry powder, stir well. 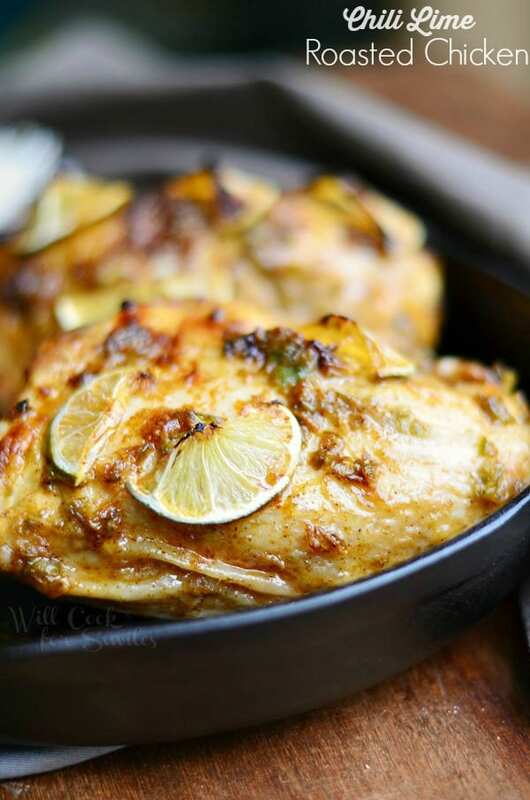 Cook for 3-5 minutes and add chicken back to the pan. Cook chicken, still over medium heat, for about 10 minutes. Make sure to carefully flip the chicken half way through for even cooking. *Recommended to serve with mashed potatoes and vegetables. I don’t think I’ve ever seen a recipe that I’ve been more intrigued by! Thank you for being awesome and recreating it! I have GOT to try this! Pinned! I’m so glad you are intrigued! It really is worth a try, it’s tasty! I am totally intrigued by this recipe. We even have the banana liquer but I do have a question. My husband does not like raisins. If I omit them will it take away from the flavor or do you have an alternative suggestion? Hi, Chelai! It won’t change the taste much if you omit raisins. It just add a little something but will be good nevertheless if you don’t add them. Hi Marta! I honestly don’t think it has an origin because it was made up by a chef that my mom knew and then she recreated it and then I recreated it 🙂 It is so good though, I really hope you’ll get a chance to make it. Banana liqueur is a pretty specialized ingredient that I wouldn’t anticipate finding in many other dishes. 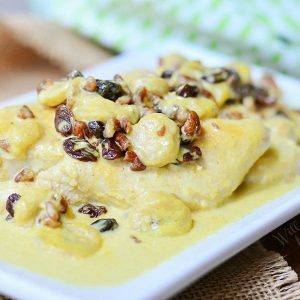 Can you suggest any alternative for the recipe? I wouldn’t recommend and substitution only because of how big of a role it plays in the sauce but what I do for these types of ingredients, is so to one of those big wine and liquor stores (like Total Wine) and get a small bottle of liquor that I need. They are usually 2-3 oz and cost a couple of dollars. That way I just get what I need for recipes and don’t have to have a whole bottle. Big stores like that usually carry a large variety of small bottles.